In this tutorial, we'll be using the NODEMCU ESP82666 (ESP8266 based development board) to create a smart IoT button that emails or texts you or your friends. To get set up with the NODEMCU ESP82666, you'll need to follow our tutorial on getting started with the ESP8266. It details setting up the correct environment to complete the rest of this tutorial. 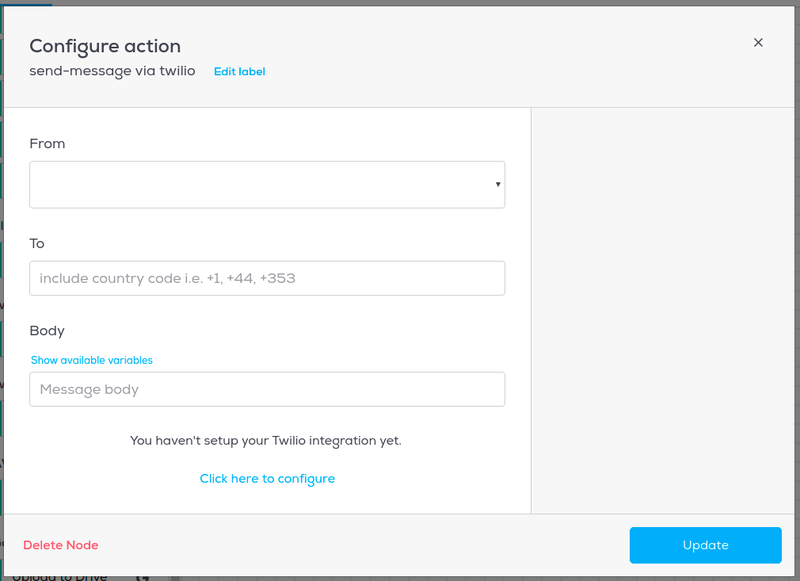 You'll also need to follow our tutorial on getting started with Twilio. Wia's Twilio integration enables you to send SMS messages. Connect the board to your computer via micro USB cable. If a library doesn't show up in the results when you search for it, you may need to update your Arduino IDE version. You can download the latest version here. Make sure the correct board is selected - go to Tools > Board and select NodeMCU 1.0 (ESP-12E Model). Port not showing up, or greyed out? If your port is not showing up, you need to install USB to UART Bridge VCP drivers. To do so, go here, then download and install the drivers for your operating system. After installing the drivers, restart the Arduino IDE. You may need to install the driver twice for it to work, as the first install will just remove the existing driver. Another cause of the port not showing up could be the USB cable - make sure that the cable you're using is not a charge-only cable, and that it isn't faulty. The code above publishes the three distinct Events to Wia. shortPress, doublePress and longPress. Each Event corresponds to the different types of button press that we coded onto the board. 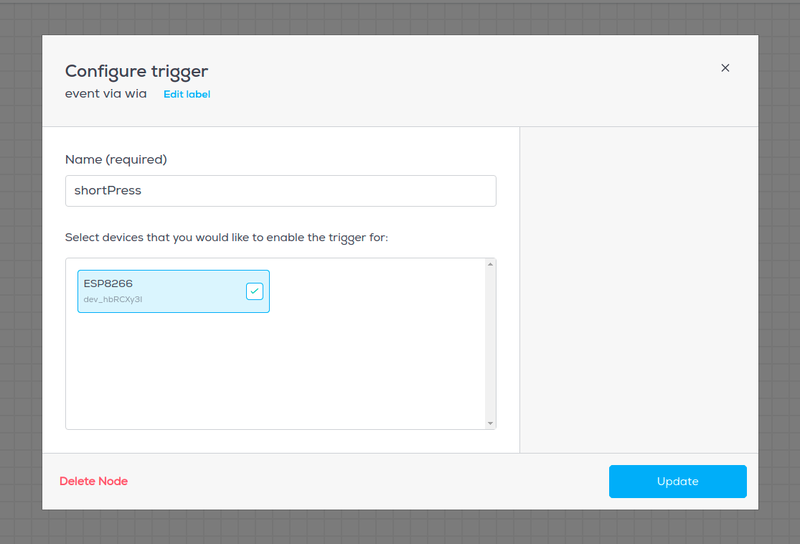 We will need three different types of Events to set up our Flows in the Wia dashboard later. Certain versions of the ArduinoJson library will cause an error in the code above. If you get an error (such as 'StaticJsonBuffer' does not name a type) when compiling the code, open Sketch > Include library > Manage libraries, search for ArduinoJson and click update. The button we'll be pressing is the one marked 'FLASH' on the NodeMCU board. Press the 'FLASH' button, go to your Wia dashboard and view the Events as they come in via the 'Debugger' tab for your Device. Note: pressing the button marked 'RST' will reboot the board. To handle our different button presses, we will be setting up different flows that all will correspond to different actions. This will enable us to do different things with our button pressing. 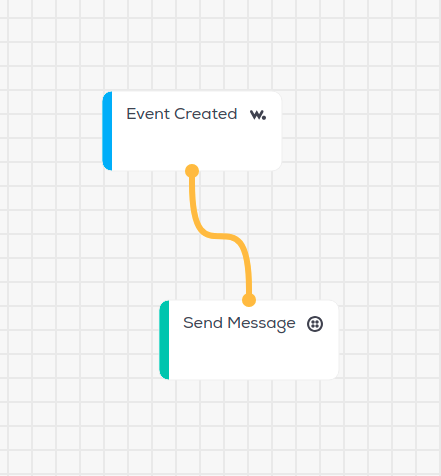 Click update, then connect the Event Created node to the Send Message node. For doublePress, we will repeat the same process by building another Flow, except this time we will use an Email node from the Wia section, to send an email. Enter the recipient email address, subject, and the desired message body. Once you have set up Flows for both shortPress and doublePress, go ahead and press the button marked 'FLASH' and see the results. Note: We still haven’t used our longPress Event yet so we are going to leave that up to you, to see what you come up with!